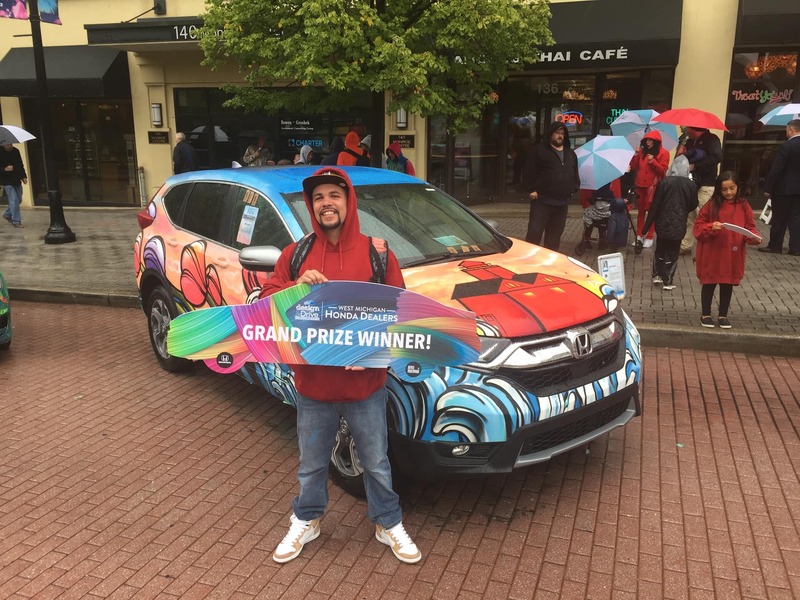 Following an Open Call for Artists to submit design ideas for how they would use a Honda as a canvas, Chris was selected as one of 6 finalists sponsored by the West Michigan Honda Dealers for the Design & Drive Art Contest. From ArtPrize kick off on Wednesday, September 19th through Sunday, September 23rd of the opening weekend, artists completed their designs. Based on a public poll on the West Michigan Honda Dealers website and Facebook page, Chris’s “Tulip City” design on a 2018 Honda CR-V sponsored by Crown Honda of Holland won the popular vote. ArtPrize 11 and the Design & Drive Art Contest will return in 2020, but follow us on Facebook for more details of how Honda will help drive the upcoming Project 1 in Fall 2019!